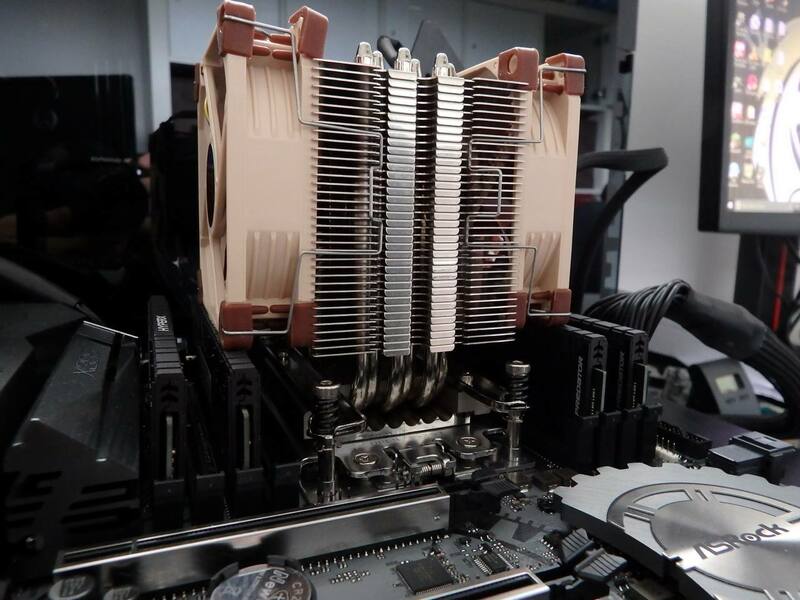 Threadripper is a beast of a processor and Noctua has released three different coolers to tame said beast – we tested them all and will take you through how to choose the right one.AMD’s Threadripper CPUs do not come with a stock cooler, and with two dies on the CPU it’s a big CPU to cool. 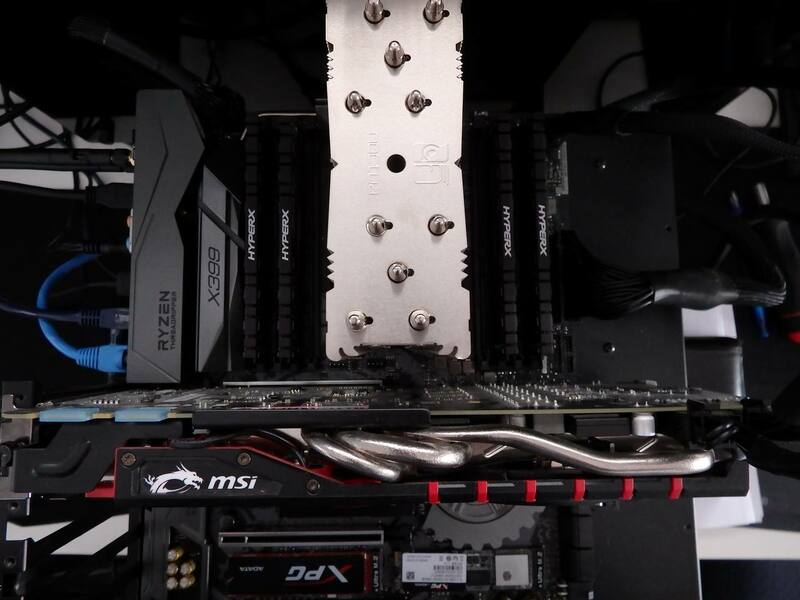 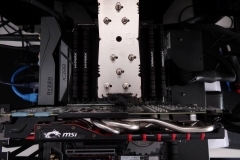 In a high-end rig, many people may be expecting to go water cooling. 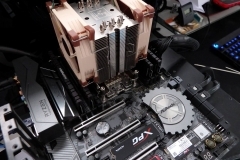 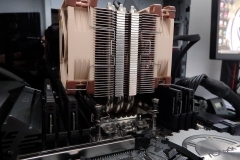 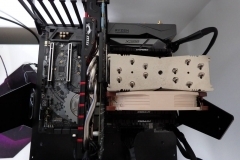 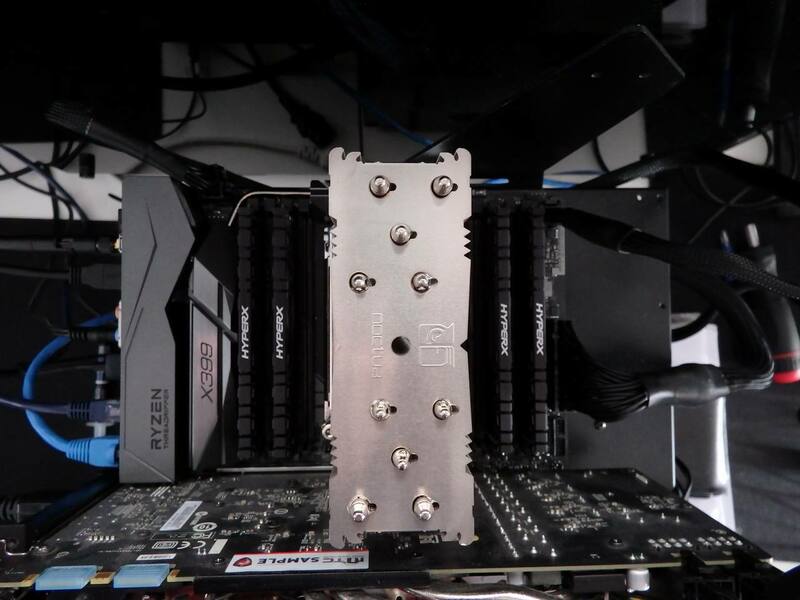 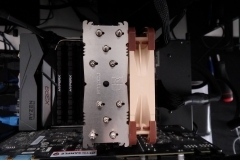 Water cooling is highly effective, no doubt, the water block also means that access around the socket is easier than a large bulky air cooler but there are challenges with water cooling that simply do not exist on a high-quality air cooler like the three that we are about to review in this article. 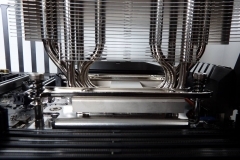 Some of the benefits of an air cooler are a lack of complexity, a lack of water and a smaller overall footprint inside the case. 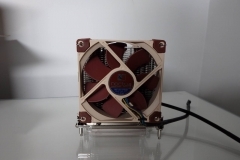 In our experience with Noctua air coolers, the acoustic profile is very low, regularly lower than the combined fan and pump noise associated with water cooling. 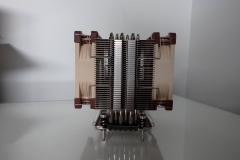 The simplicity of the Threadripper Noctua range is that they consist of a high-quality heat-sink and a single fan (with the exception of the U9 cooler that has two 92 mm fans) to keep the beastly CPU under control. 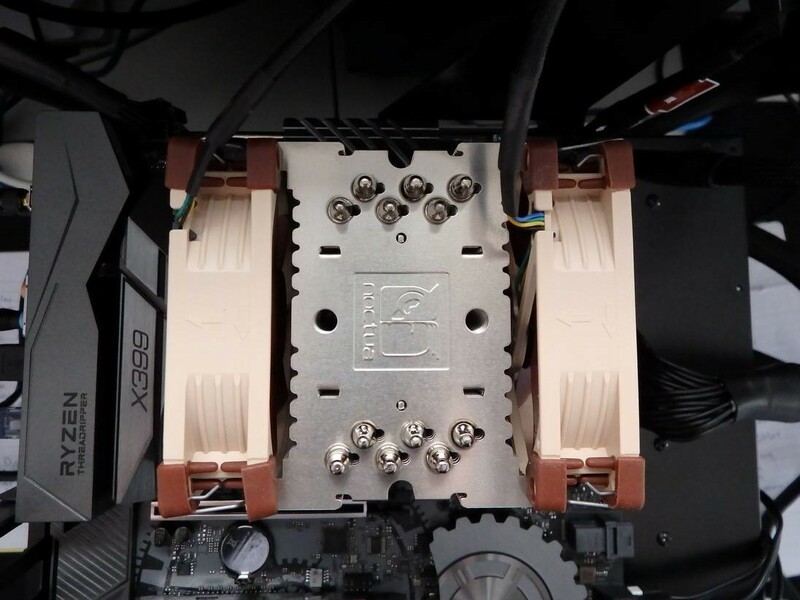 The U14S is rated at 180W and support overclocking while the U12S and U9 coolers are rated at 180W and not recommended for overclocking. 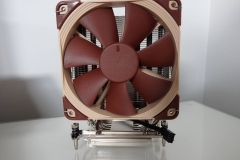 The Noctua ratings are perhaps a little conservative as we were able to sustain and overclocked with the U12S. 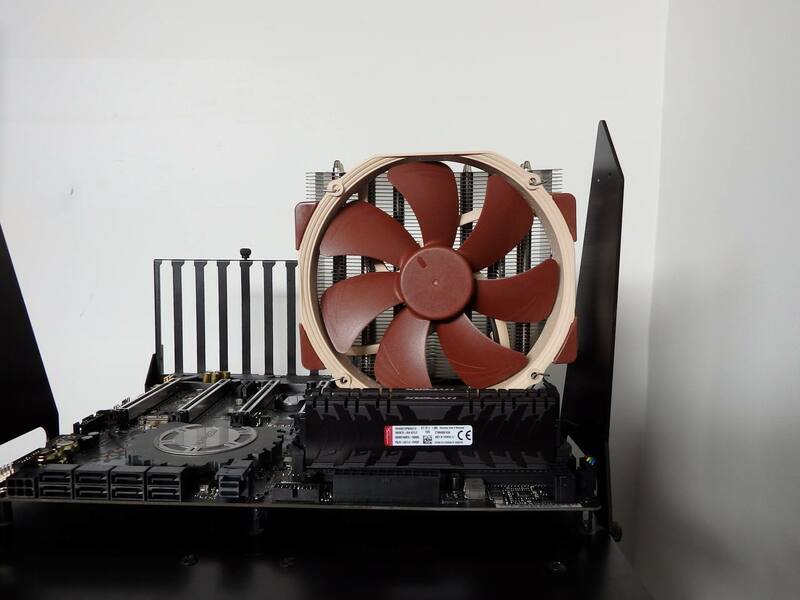 The beauty of an air cooler is that it either works or it doesn’t and it’s very easy to check if the fan is not spinning. 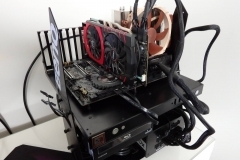 With a water cooler you need to make sure that the pump is running, and at the right speed, that the fans are also running and at the right speed, and that the hoses are not in any way obstructed or subject to chafing on other components. 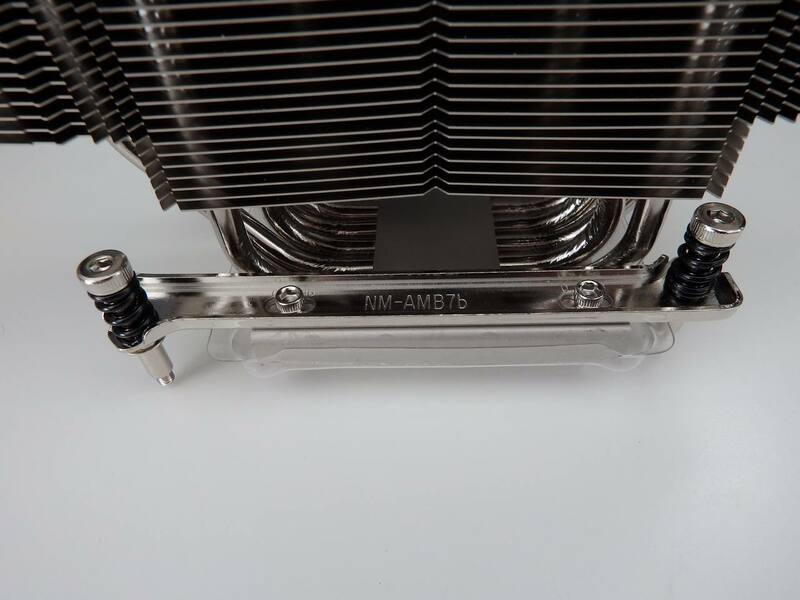 So let’s look at the line-up: all three CPU coolers have the TR4 oversized CPU contact plate. 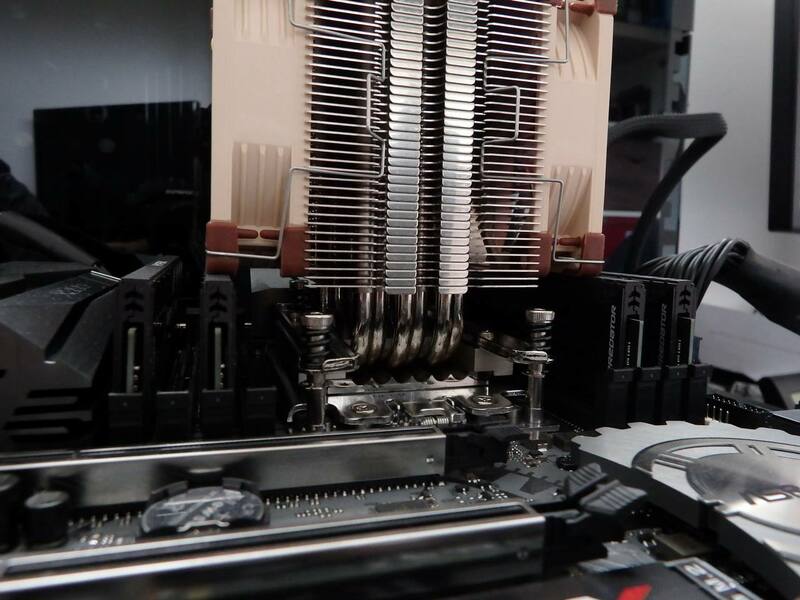 This is something that we don’t even see on all water coolers; many water coolers have standard sized water blocks and an adapter for the TR4 socket. 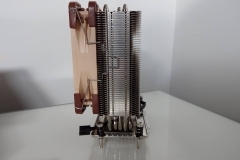 This means that the Noctua coolers will make better CPU contact and allow better heat transfer away from the heat spreader covering the dies. 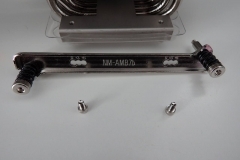 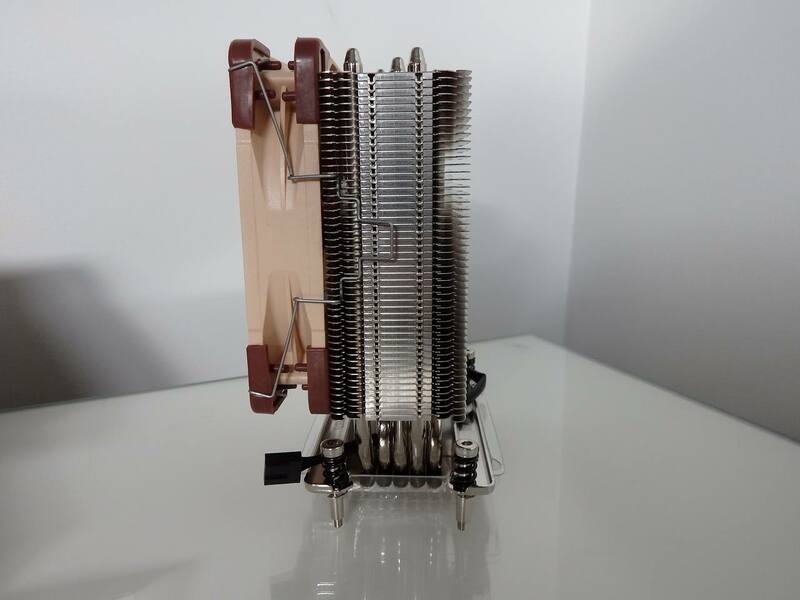 Whilst some of the water coolers may have a better heat exchanger it should be noted that contact with the CPU heat spreader is also very important and something that Noctua has obviously paid a lot of attention to. 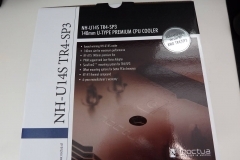 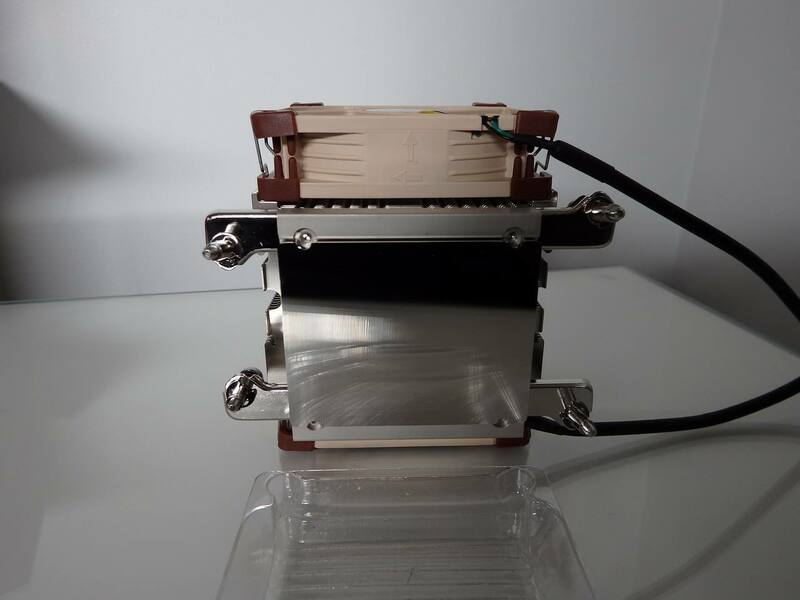 The mounting mechanism does not involve any backplate or separate mounting struts as per other sockets, these coolers are for one socket only and no assembly or configuration is necessary prior to fitting other than the application of the Noctua NT–H1 thermal compound. 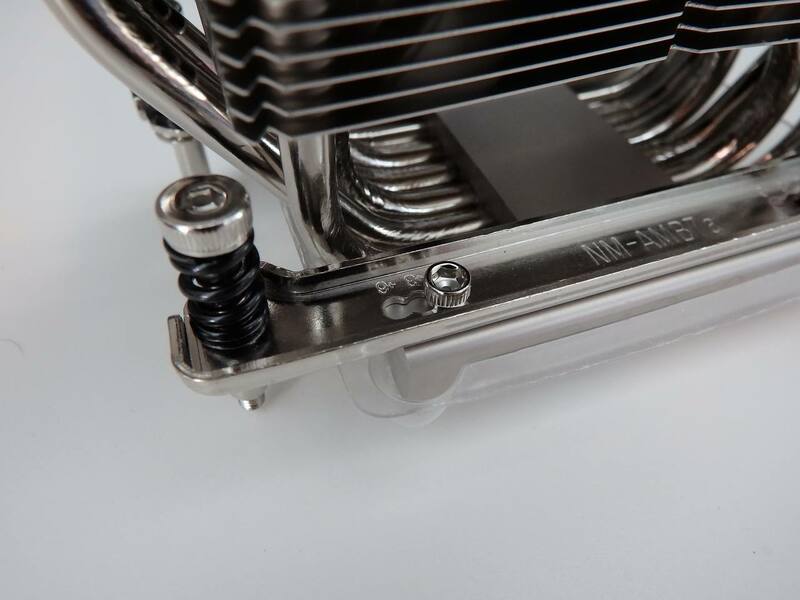 The U14S and U12S coolers do have an adjustable offset that allows the cooler to be offset by three or 6mm from centre, allowing for larger graphics cards in the first PCI-E slot. 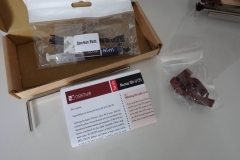 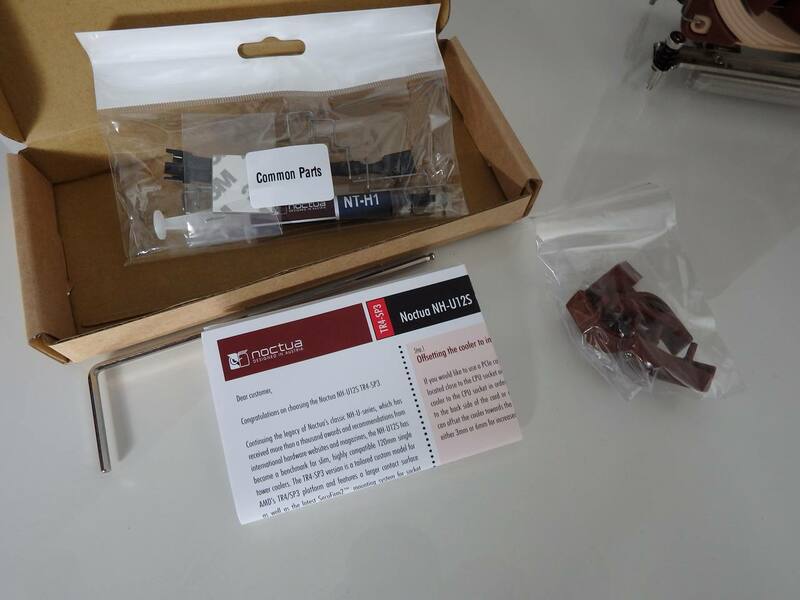 This offset is a welcome addition and further evidence that Noctua consider how the customers will be using their products. 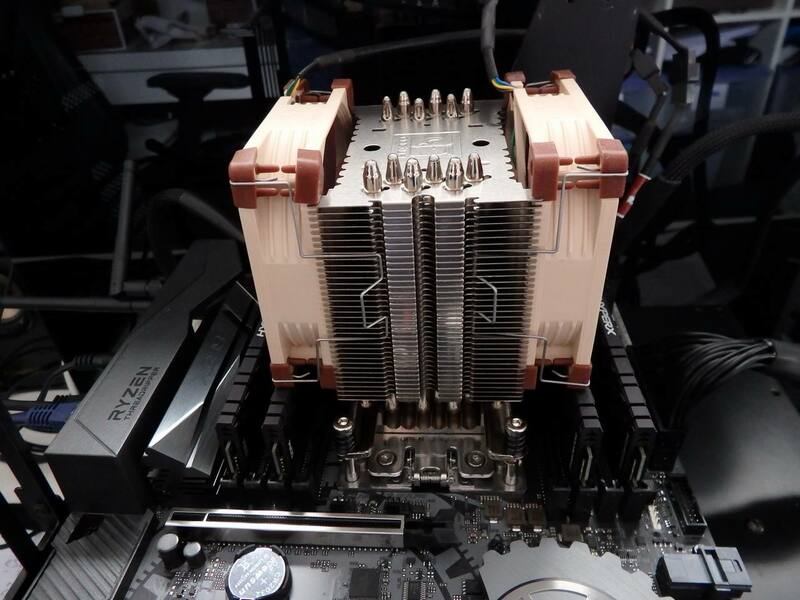 The largest cooler in the list is the U14S, a 140mm cooler with a single NF–A15 fan and a single tower slim heat-sink. 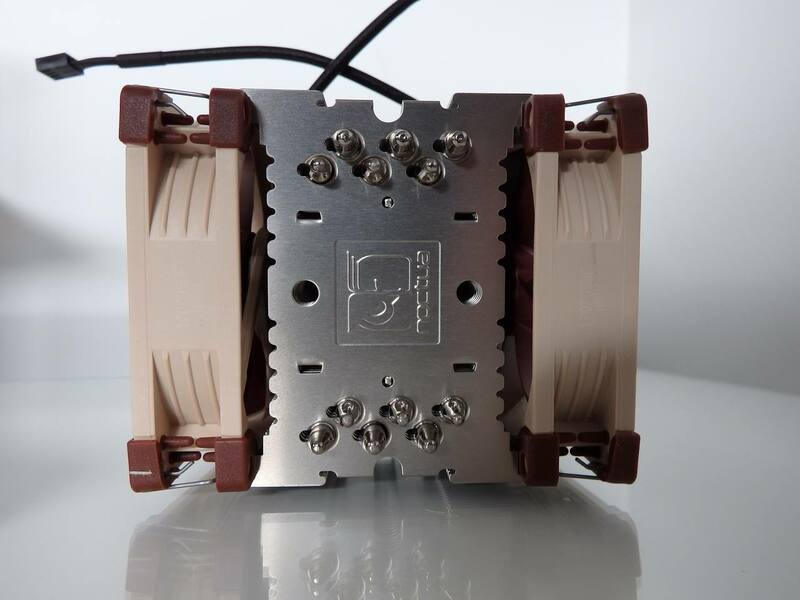 This design has proven highly effective on other sockets; the main difference noted on the TR4 model is the mounting mechanism with a very large CPU contact plate. 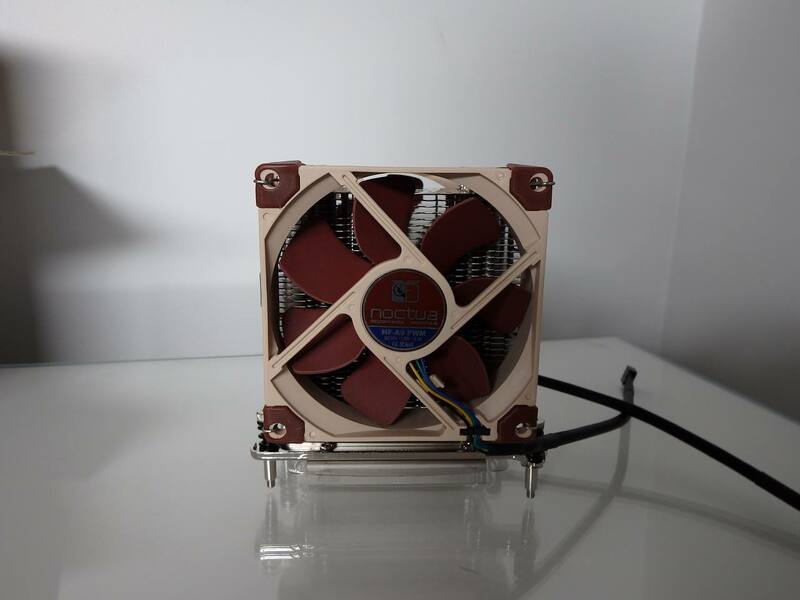 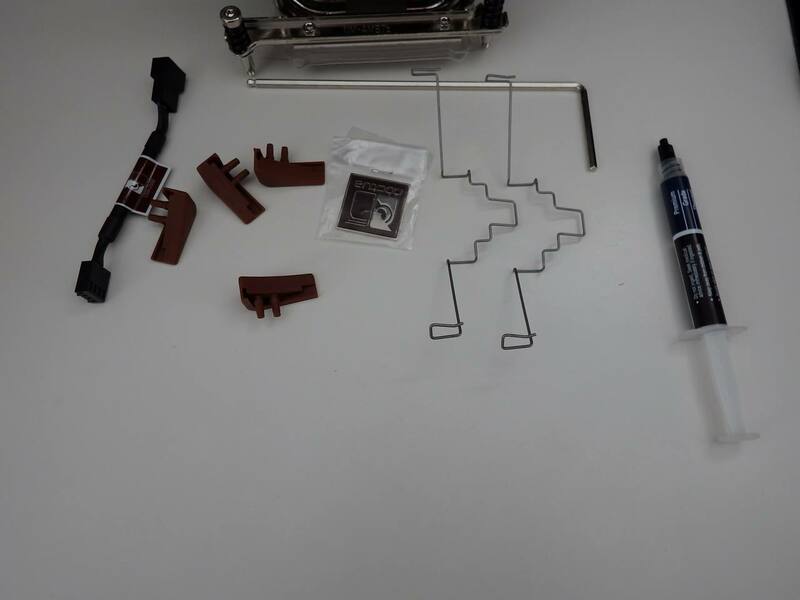 The fan attaches to the front of the cooler and Noctua has included fan clips and vibration pads for a second fan, should the system builder wish to purchase and fit one. 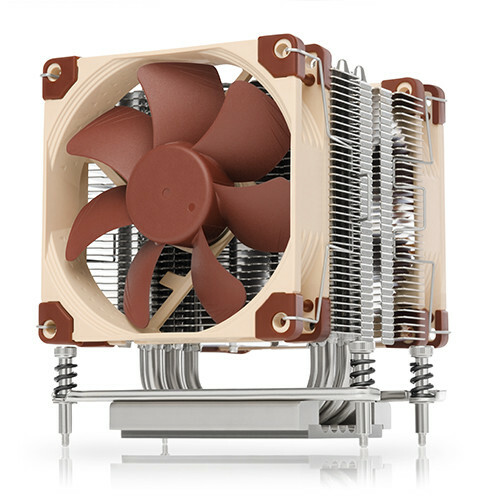 The fan can be adjusted vertically to allow for taller memory modules. 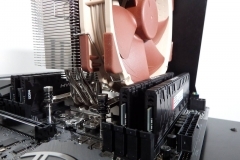 If using only four memory modules instead of eight, the front mounted fan will clear the first slot and shouldn’t be an issue on most boards. 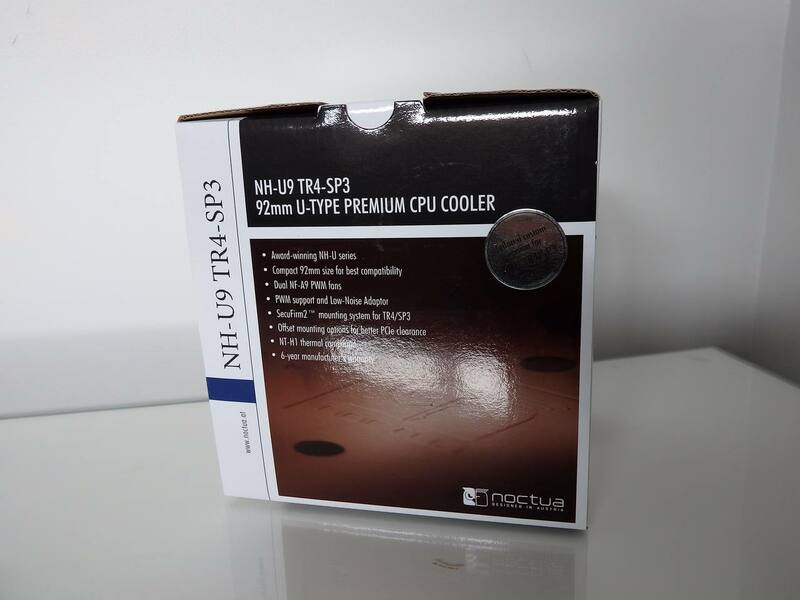 The noise profile of the NF–A15 PWM fan is very quiet even when speeding up or slowing down, which when compared with this product’s ability to handle a mild overclock makes this cooler a very compelling simple alternative to a water cooler. 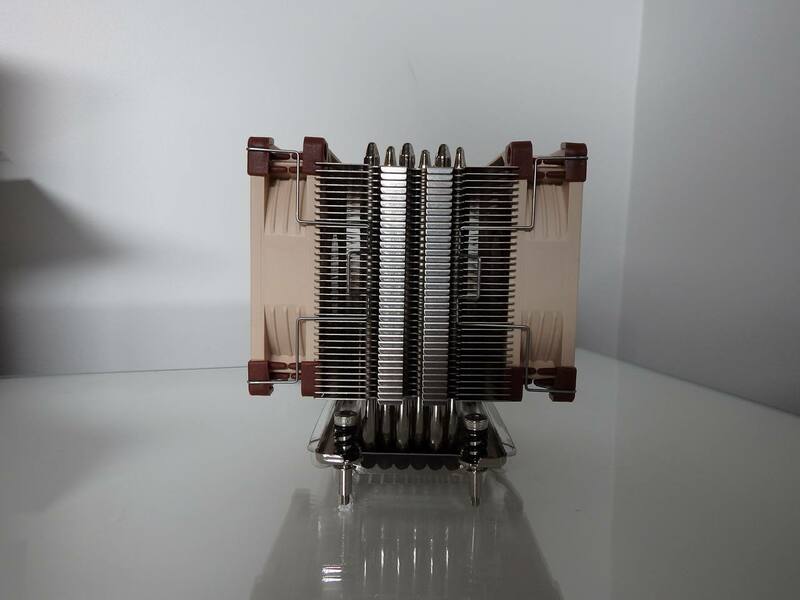 If you’re not planning to overclocked your Threadripper CPU, the U12S 120mm cooler should have you covered. 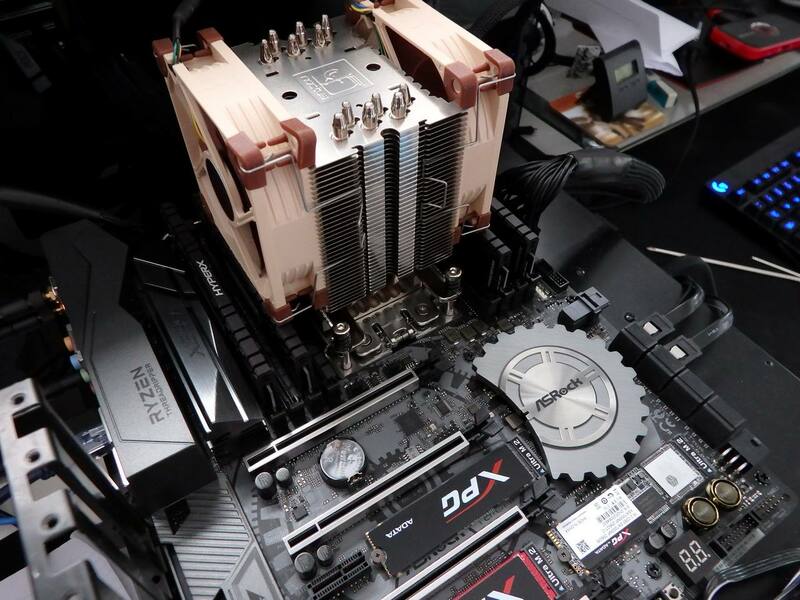 Although it can handle a mild overclock, it will depend on your CPU and how much additional voltage is needed for the overclock to be stable. 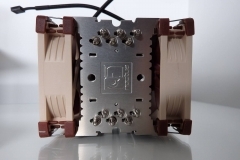 This model really is just like a smaller version of the U14S with the same large TR4 socket-sized CPU plate and offset mounting system. 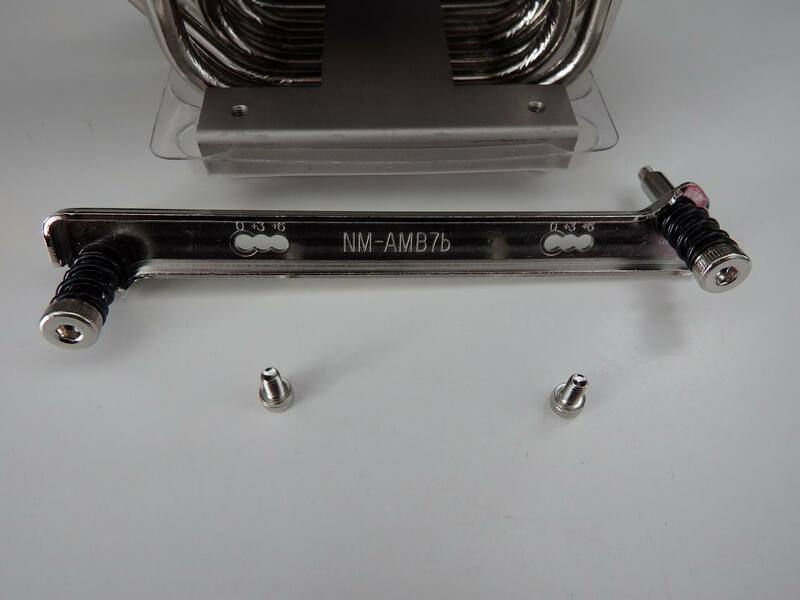 The offset mounting system isn’t as beneficial on the 120mm cooler as it is on the 140mm cooler because the clearance issues are less likely to be an issue with an additional 10mm of clearance on either side. 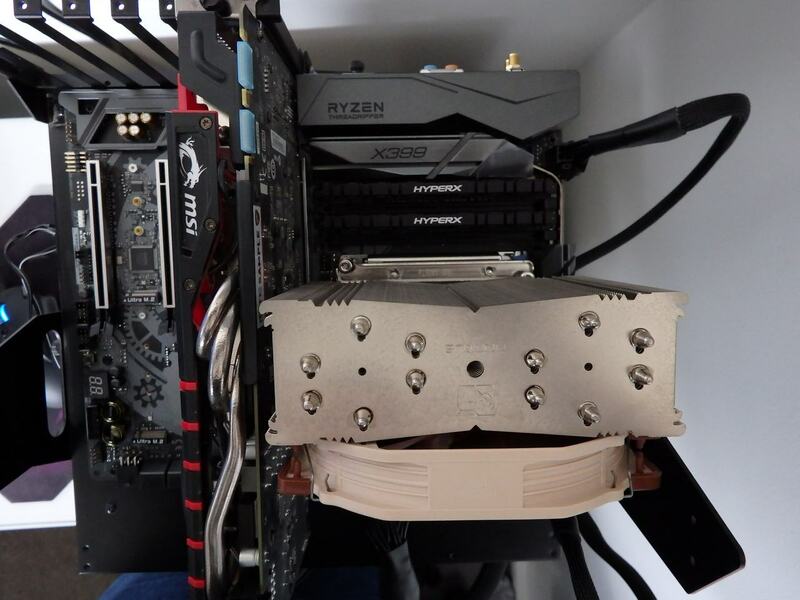 If running the Threadripper at CPU stock settings this cooler is barely audible on an open test bench and would be almost silent inside a case. 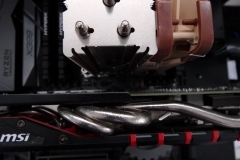 Where an even lower-profile cooler is required – for productivity workstations or where cases are either low-profile desktop or potentially rack-mounted servers – something less than the 120mm U12S model is needed; Enter the U9. 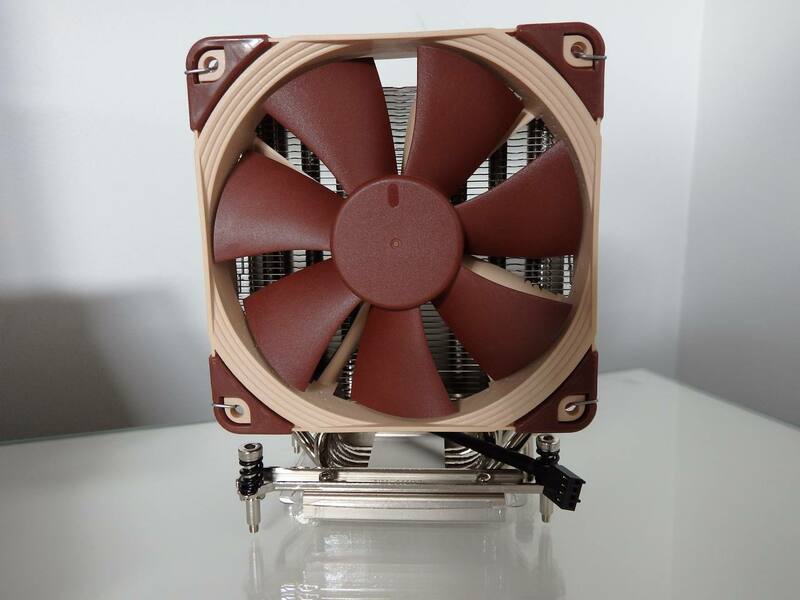 The Noctua U9 cooler uses two 92mm fans to pass air through an almost square fin stack, and for stock settings, it does a very good job with a very low noise profile. 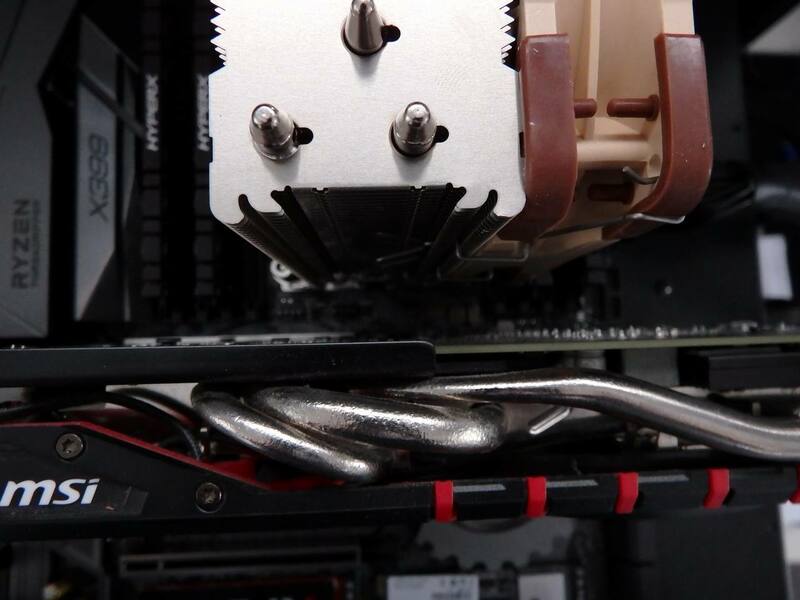 The fans do add to the depth of the cooler which means that they need to be raised in order to facilitate the population of all eight RAM slots but the 92 mm width of the cooler means that it will not get in the way of graphics cards or anything that uses the first PCI-E slot. 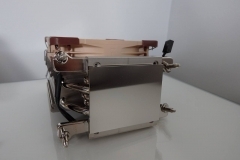 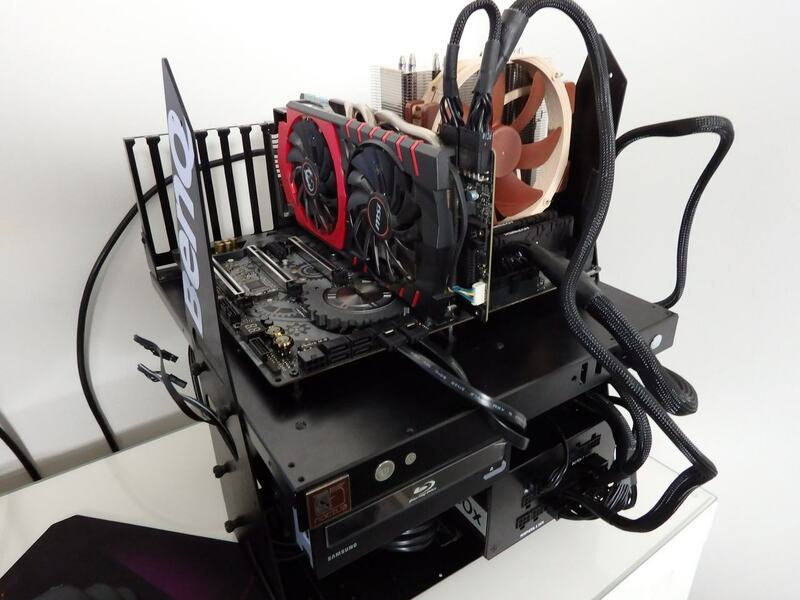 As with the other coolers, this one also has a large full-sized CPU contact plate and mounting system, although this mounting system is not adjustable and cannot be offset as there is no need. 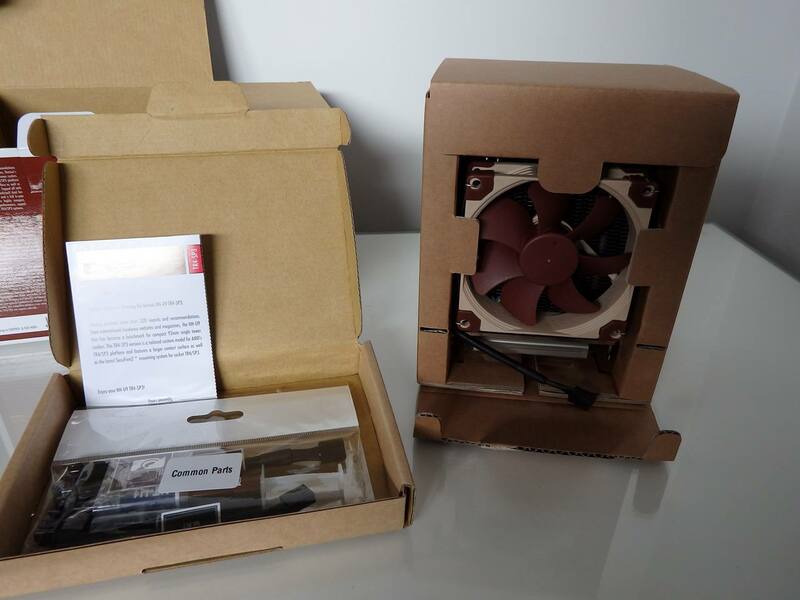 The build quality of all three coolers was absolutely flawless as was the packaging and condition of all review samples when we opened them. 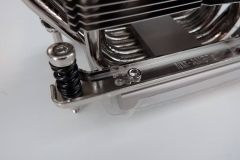 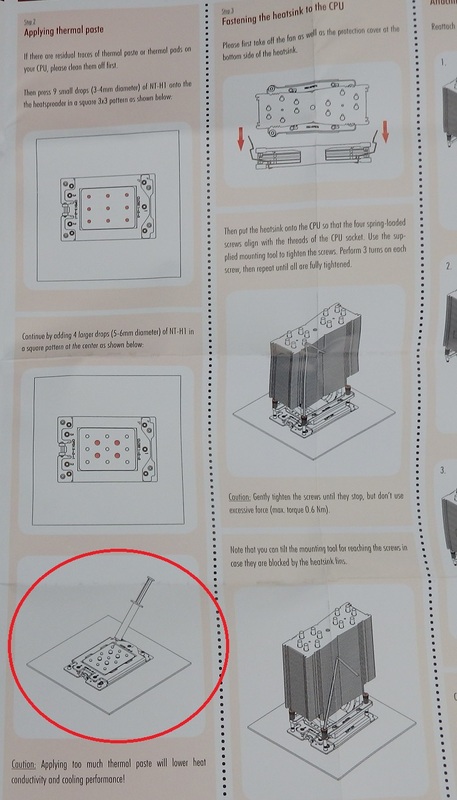 Mounting the coolers was a simple exercise and no more involved than mounting a water block. 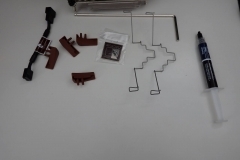 The instructions require the application of more thermal compound than we were used to, but we followed accordingly and had good results thermally despite what felt like an excessive amount of paste. 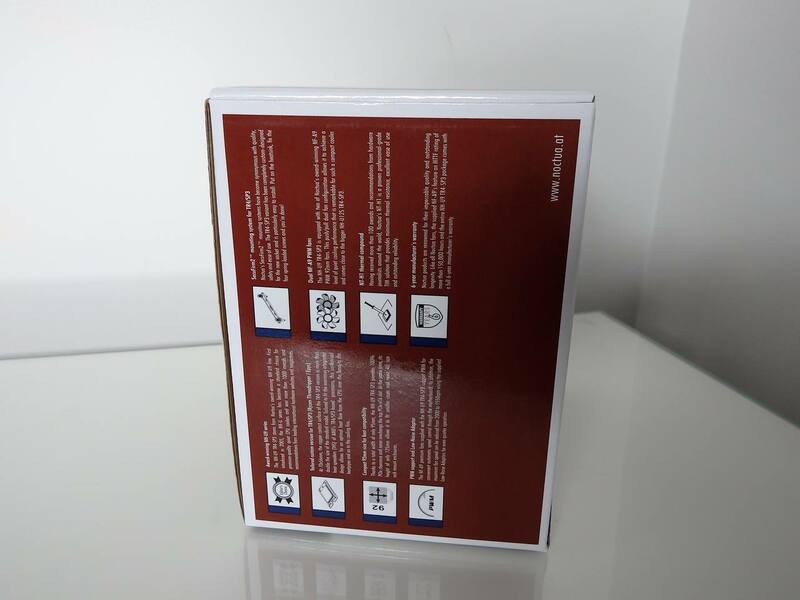 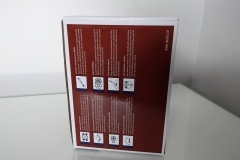 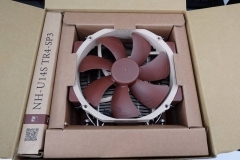 The Noctua instructions for all three coolers were at the same high standard that we have become accustomed to in our use of Noctua coolers since 2011. 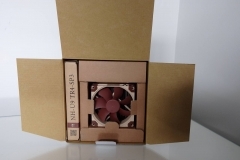 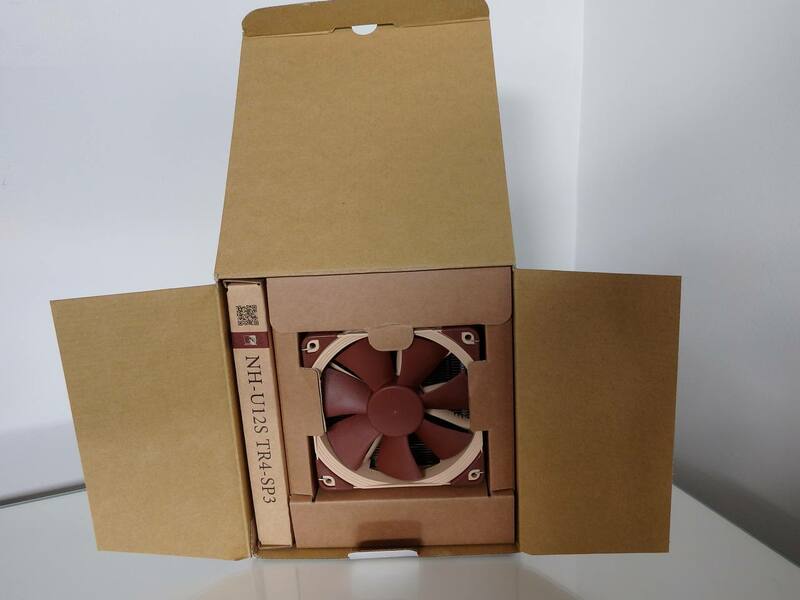 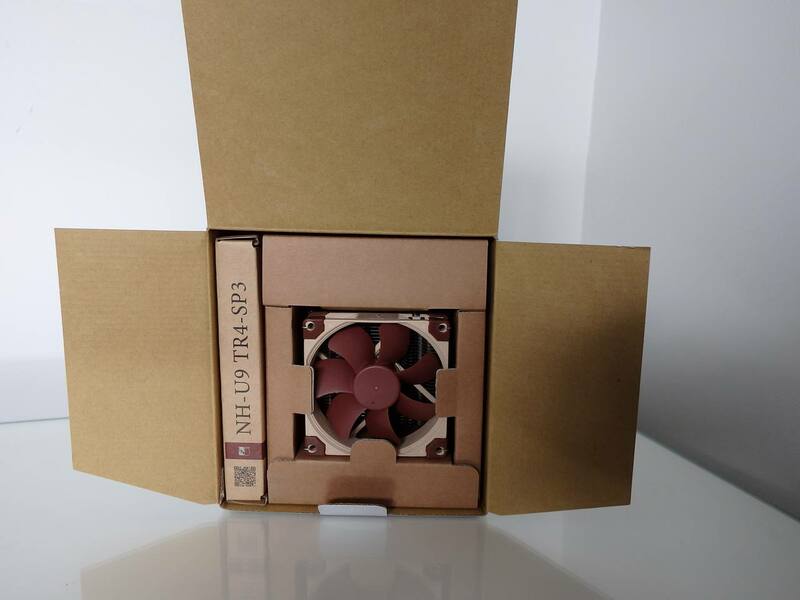 It is also worth noting that in the six years we have been testing Noctua coolers, we have never experienced a problem with any and continue to use them. 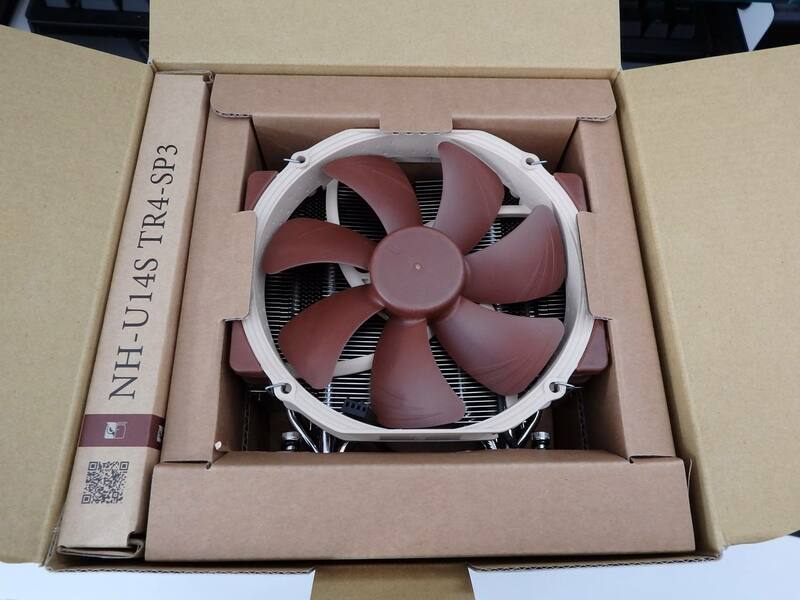 Recently, we deconstructed a system that has been running 24×7 since 2012 using Noctua NF-F12 fans; the thermal performance of the Corsair H100 cooler paired Noctua NF-F12 fans has not changed in time – these fans still work as well as the day they were installed five years ago. 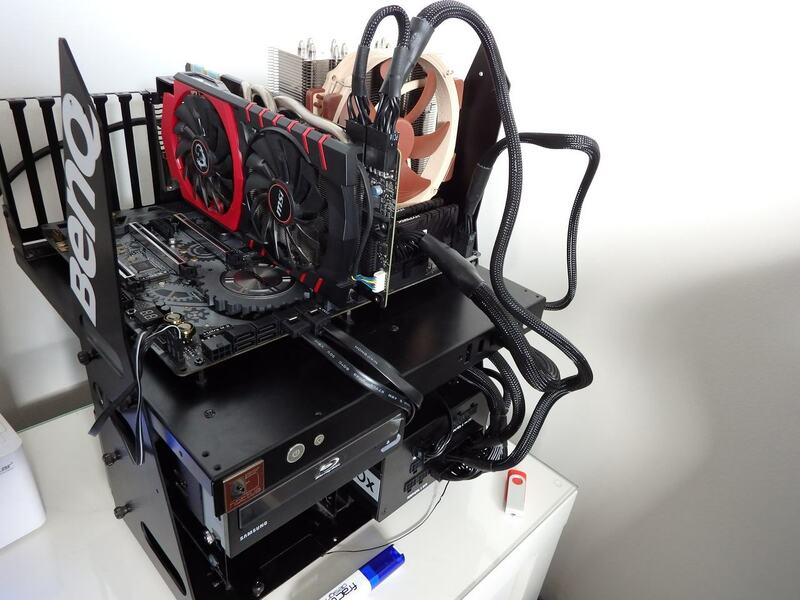 We used OCCT to run a 45-minute test with 5-minute idle periods either side. 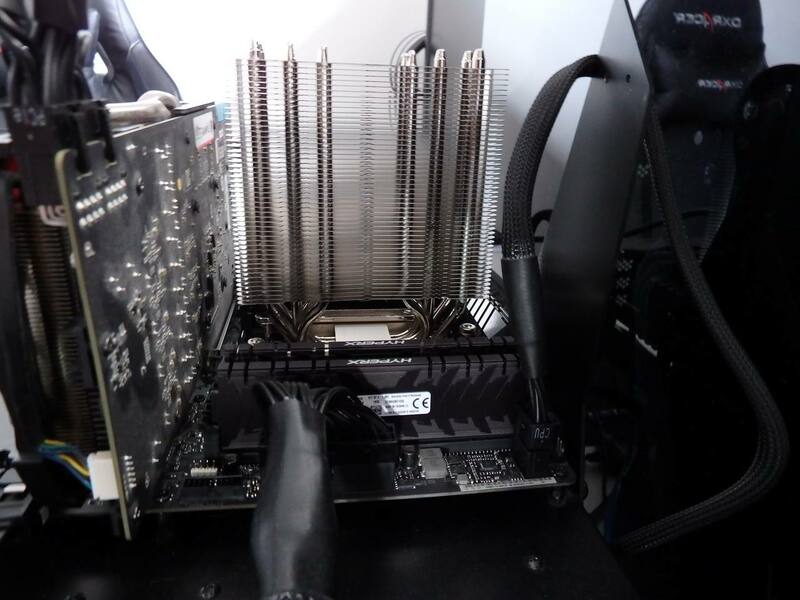 The test system was left in an idle state for 30 mins prior to the testing for each run at the applicable fan speed (12v or PWM curve). 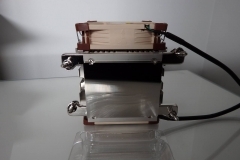 Temperature monitoring was done with HW Monitor V1.33 using Tdie, not tCTL. 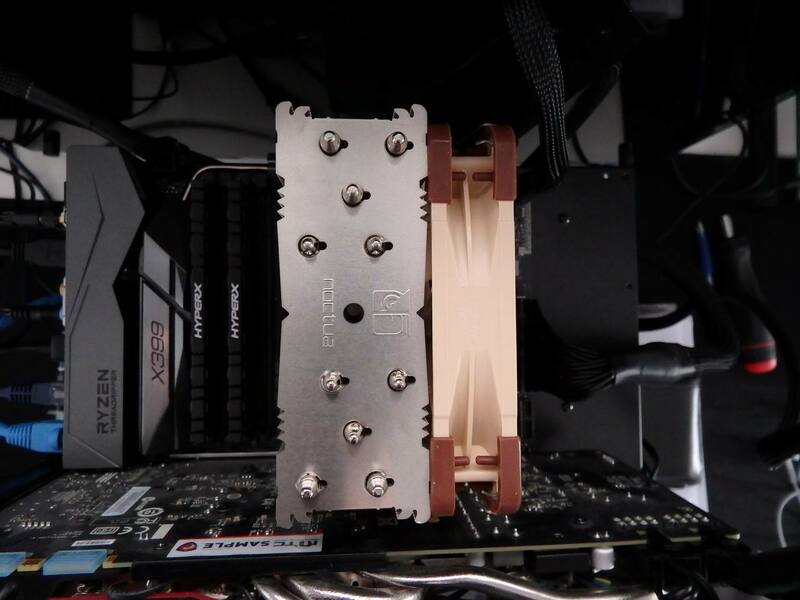 When testing the Noctua coolers with our 1950X at 12V it was a good indication of what the cooler is capable of running full speed. 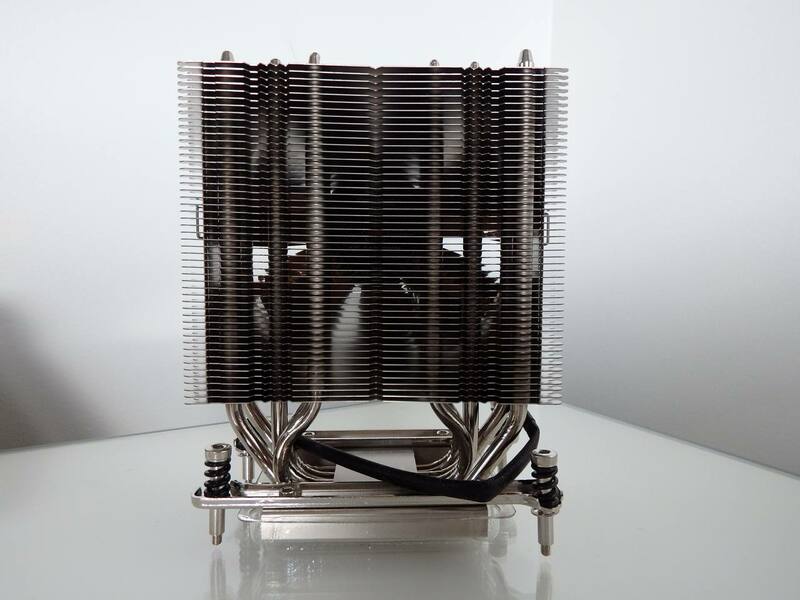 The results were relatively predictable in that the NH-U14S TR4 was the best performing with its larger heatsink and fan. 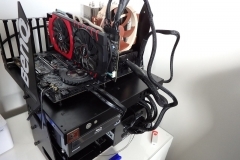 Keep in mind that the temperatures were taken in a room with an ambient temperature of 22°C – the readings were taken using the Tdie (not tCTL with the +27C offset) in HWMonitor v1.33. 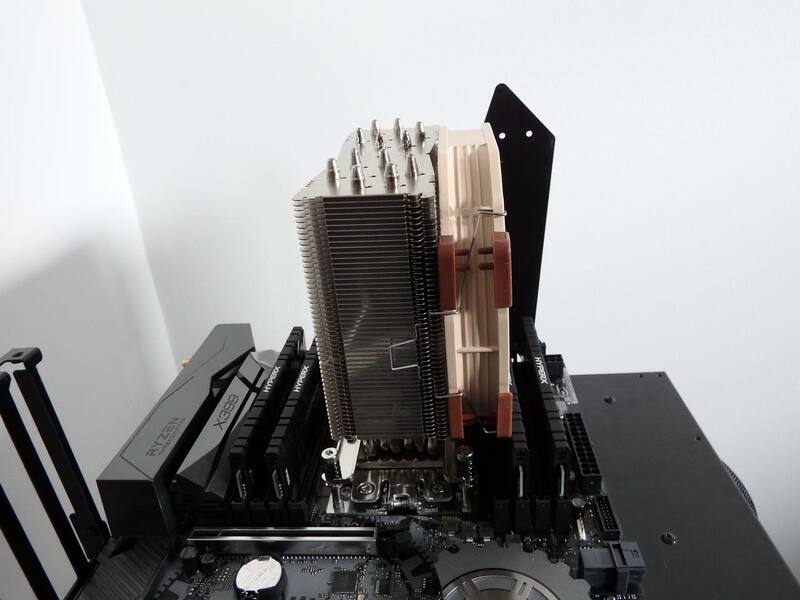 The orange line at 68°C represents the throttling point for the CPU. 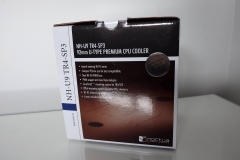 Temperatures above this line will result in the CPU performance degrading. 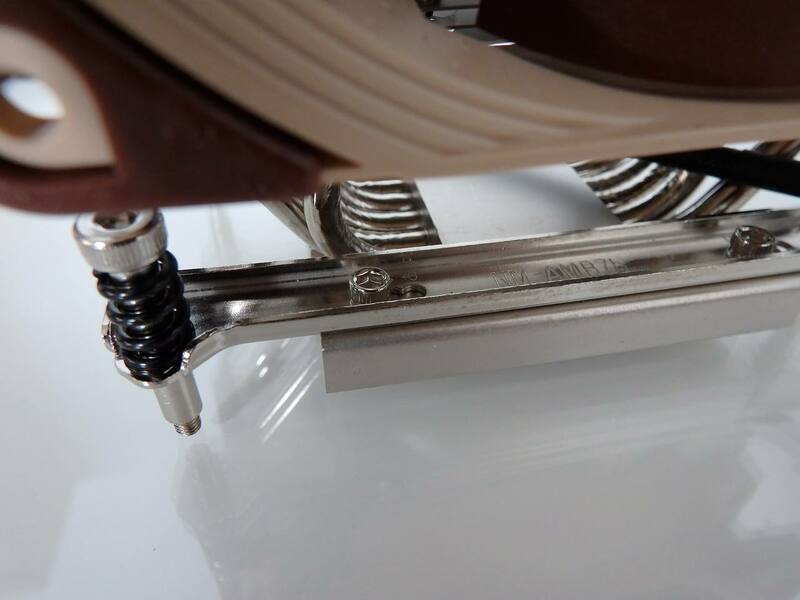 The NH-U12S came in second trailing the NH-U14S by about 5°C. 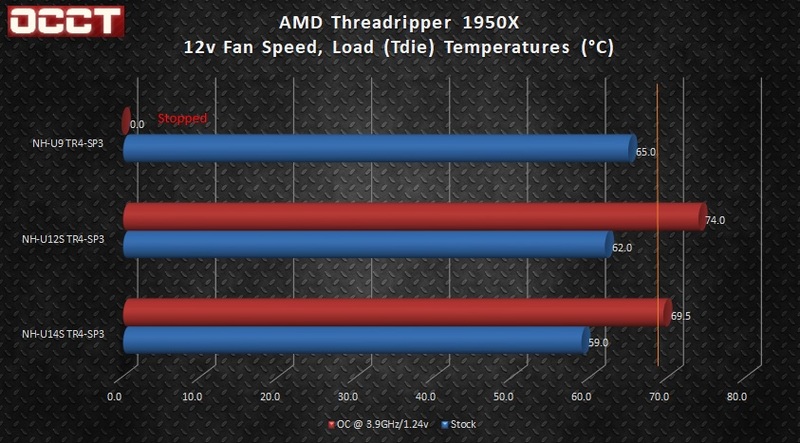 The U9 cooler did a respectable job of cooling our 1950X at stock settings being only 4°C warmer than the U12S at 12V. 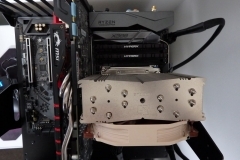 As expected the NH-U9 didn’t have the ability to tame an overclock. 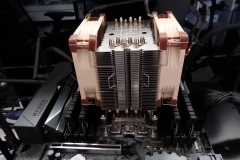 It didn’t just nudge over but exceeded it early and we stopped testing due to high temperatures and throttling. 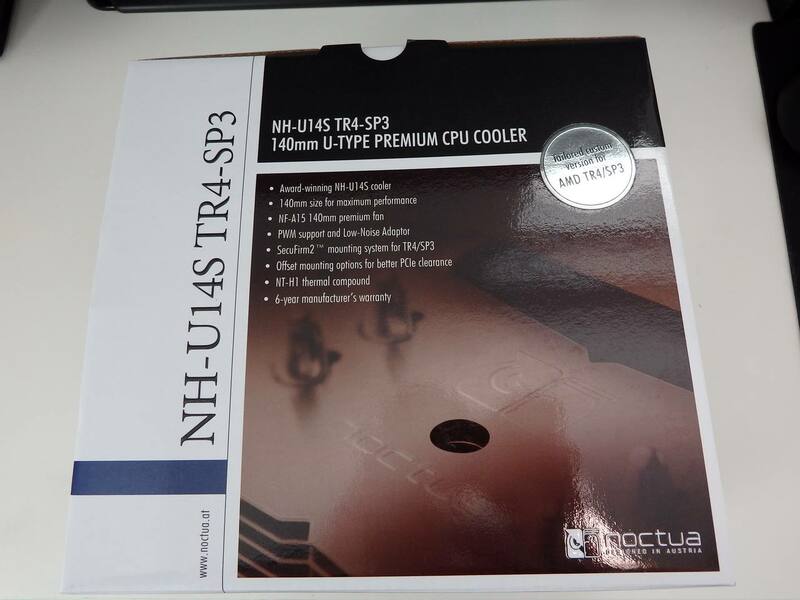 Noctua, to their, credit have not rated U9 or the U12S formally for use when overclocking a Threadripper CPU. 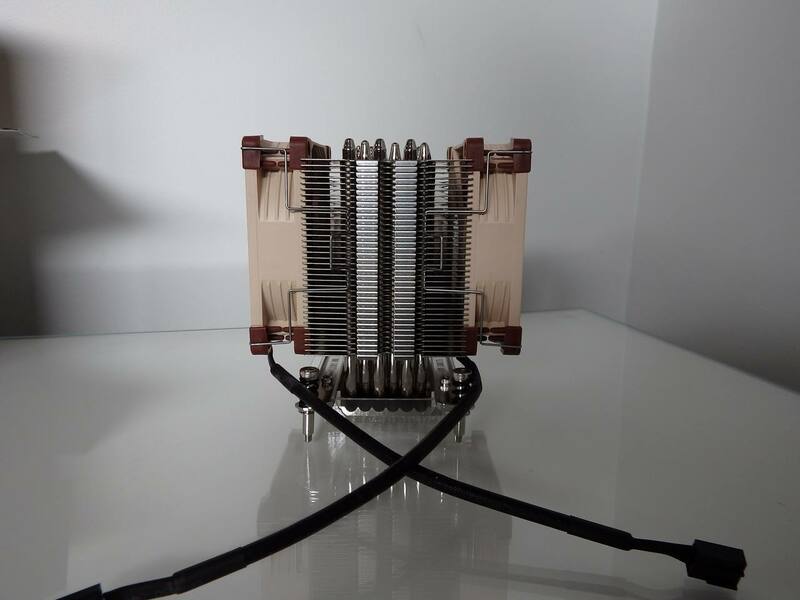 Thermally the U12S is probably what we would consider borderline for overclocking and we would need to settle for a milder overclock to keep temperatures under 68. 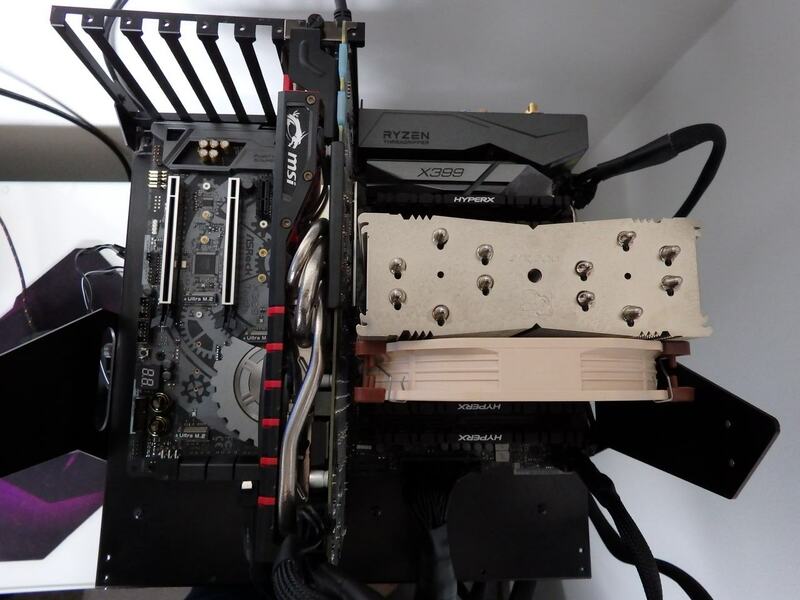 Although the U14S breached 68°C, this was a peak reading on a sustained test so depending on the nature of the workload and the level of the overclock, throttling may not occur on this overclock with variable workload such as gaming. 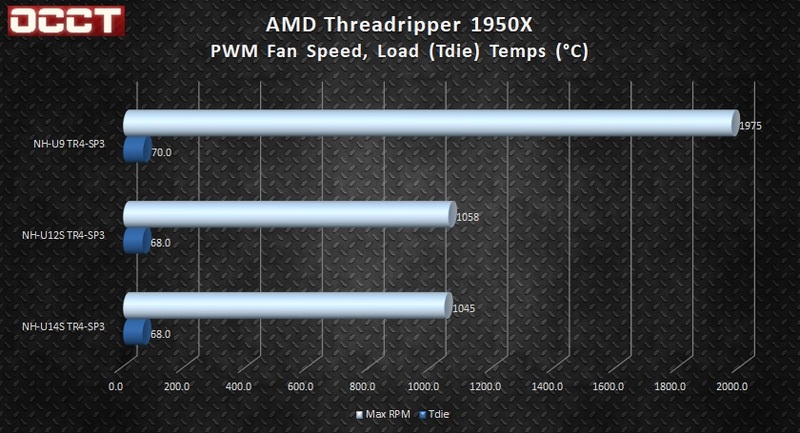 This also proves that the NH-U14S TR4 SP3 is capable of a sensible overclock. 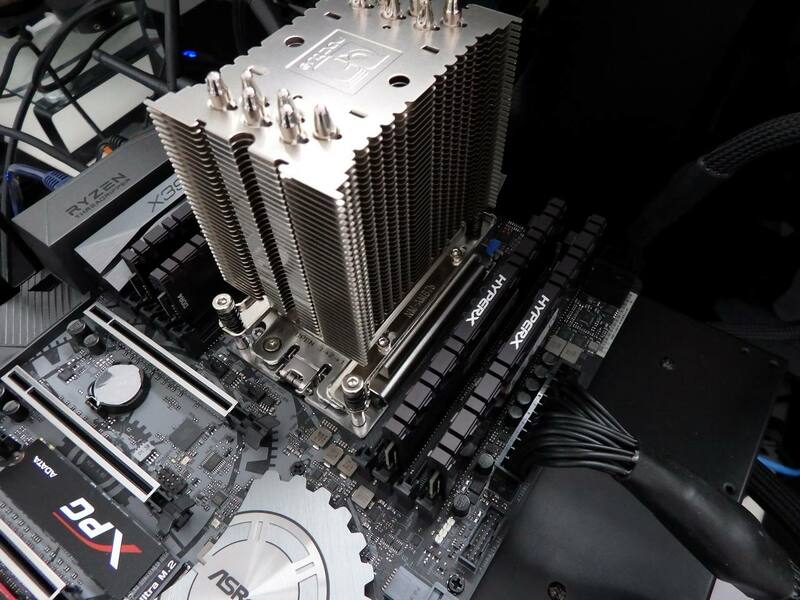 The PWM fan speed testing uses the same profile in the ASRock software. 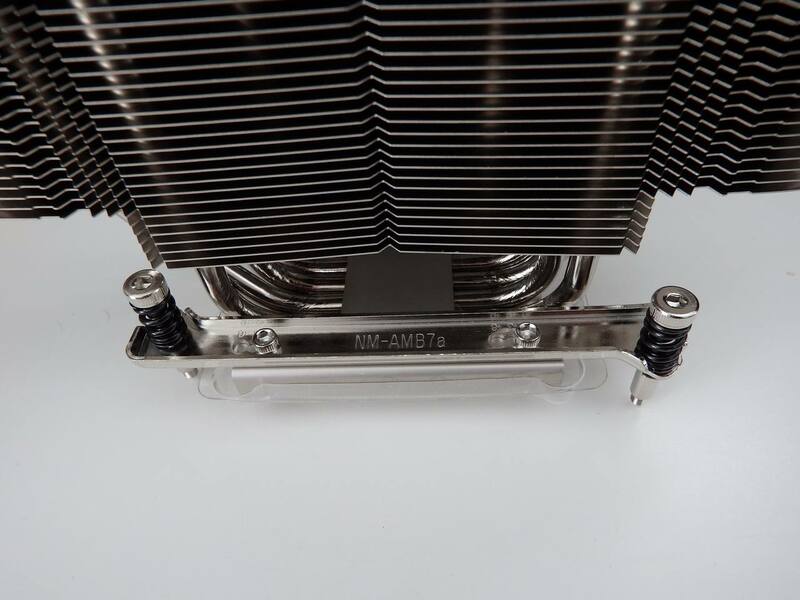 The intention of this testing is to determine how hard each cooler has to work to maintain the target which is under sustained load. 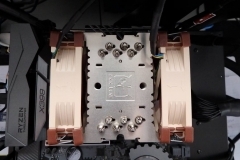 The U14S and U12S TR4 coolers were much more effective at a constant 12v / 1500RPM for sustained load testing, but also more audible. 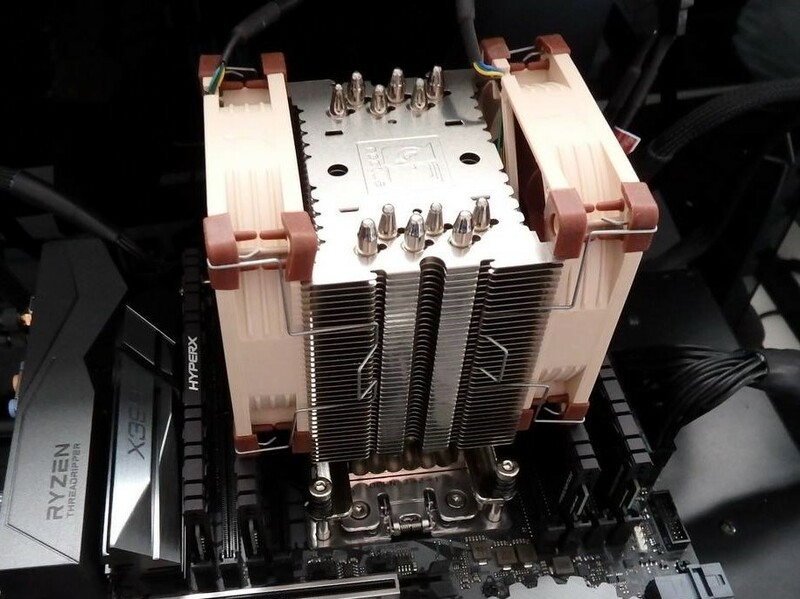 PWM is also a more “real world” configuration as we would only expect a very small minority to run coolers like these at 12v constantly. 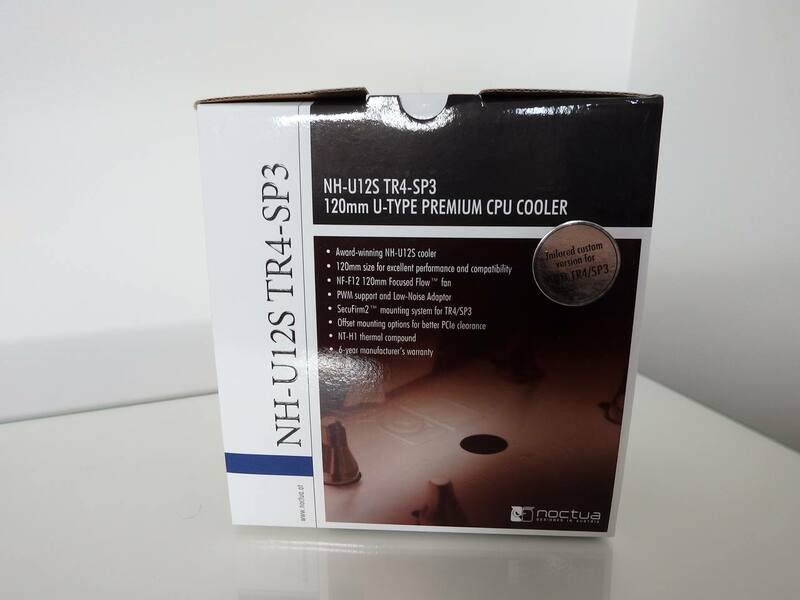 Straight away see that the NH–U9 cooler needs to spin its fans almost twice as fast as the other coolers and still runs 2°C warmer. 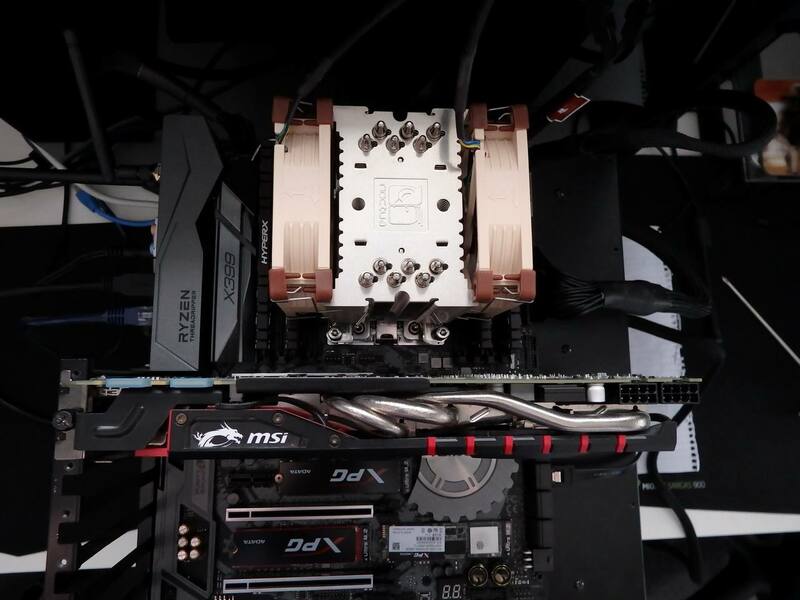 The PWM test was done under sustained load which makes it very similar to the 12v test but it’s worth noting that both the NH-U12S and NH-U14S have fans capable of 1500 RPM but only need about 1050 RPM to maintain 68°C temperature on the CPU. 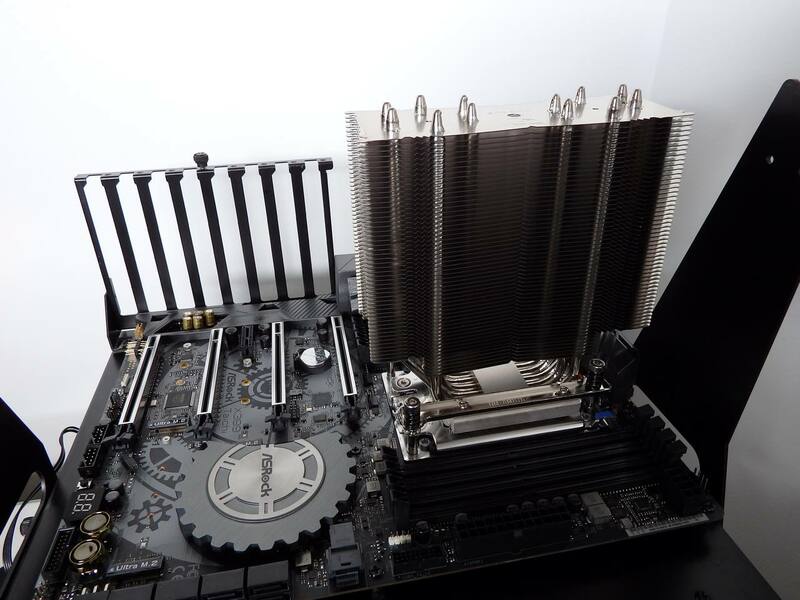 At this speed, the two larger coolers are still very quiet with ample room to increase the fan curve from the ASRock balanced default. 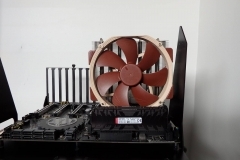 Typical load is significantly less than an OCCT test run and we found that the coolers would run at approximately 50% of the RPM (at ‘stock’ CPU configuration) that we saw on the PWM fan speed graph above. 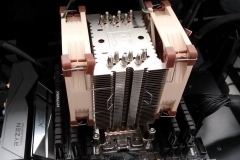 It is also worth noting that the NH-U9 result is a little misleading as the Tdie reading of 70°C is a peak reading and typical use was well below the throttle point. 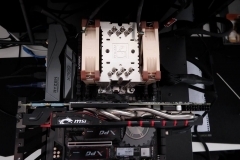 For typical use with a variable load, all three Noctua coolers are certainly viable options for an AMD Threadripper platform. 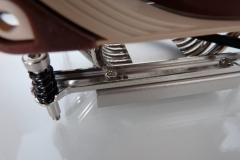 Under normal operating conditions, both the NH-U14S TR4-SP3 and the NH-U12S TR4-SP3 seldom went over 1,100RPM which was not fast/loud enough to reliably register on our decibel meter above the ambient room noise of about 19dB(A). 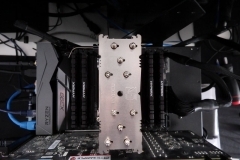 On the open test bench, this noise was barely audible, though I could hear it from 60cm away. 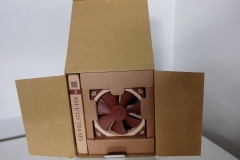 When placed inside a case, (depending on the case), this noise would likely be contained or at least not heard over graphics card coolers or case fans. 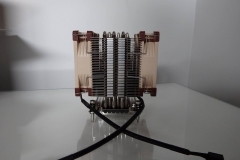 At 12v, these coolers registered at 27-31dB(A) – on the open test bench at a range of 30cm. 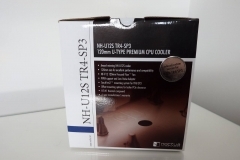 The NH-U9 TR4-SP3 has two 92mm fans that spin 500RPM faster at 12v than the other coolers in the review. 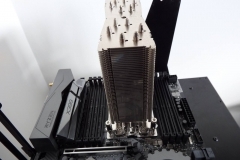 They also need to spin faster to keep the Threadripper CPU in check which does make the U9 a louder cooler but relatively speaking, it is still what we would consider acceptable, registering in the 39-43dB(A) region at 30cm on the open test bench. 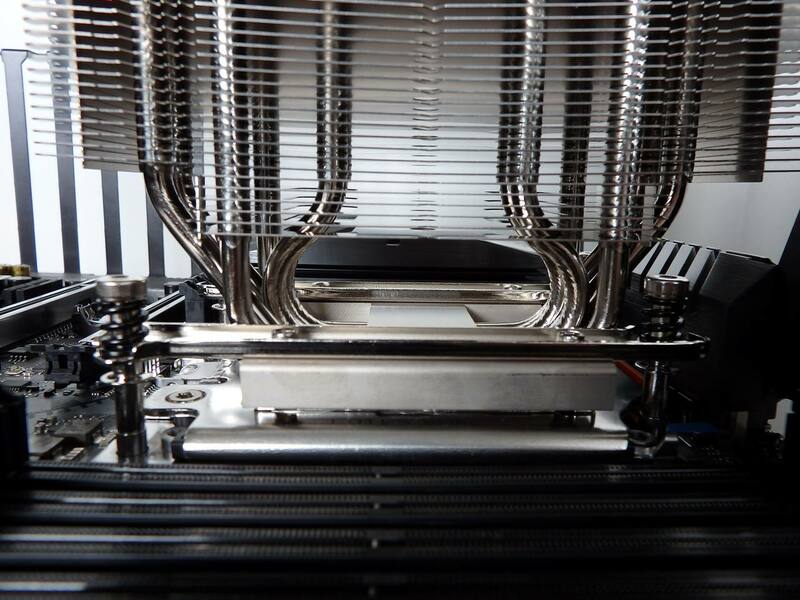 The typical reading was below 40dB(A) but it did peak on the speed shift sometimes at up to 43dB(A) under extreme load. 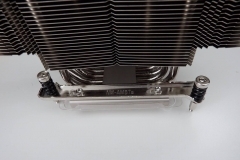 The main difference was that the U9 cooler was in the 1600-2000RPM range more often than the other coolers, its fans spending more time in this range due to the smaller size and surface area for heat exchange on the little 92mm cooler. 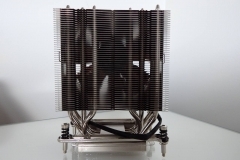 For people wanting to keep it simple, air cooling is about as simple as it gets. 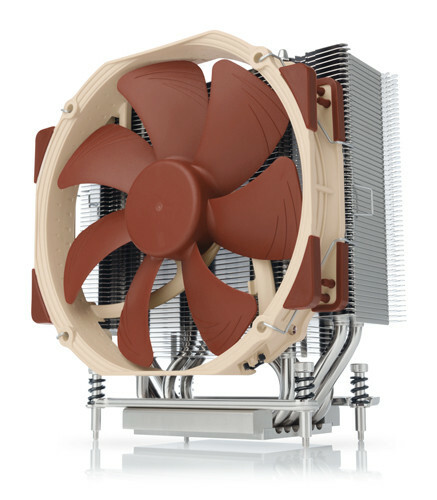 All three coolers from Noctua are very capable and allow flexibility for different case constraints, noise or overclocking. 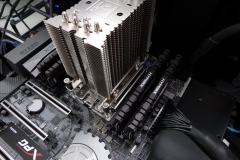 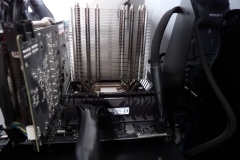 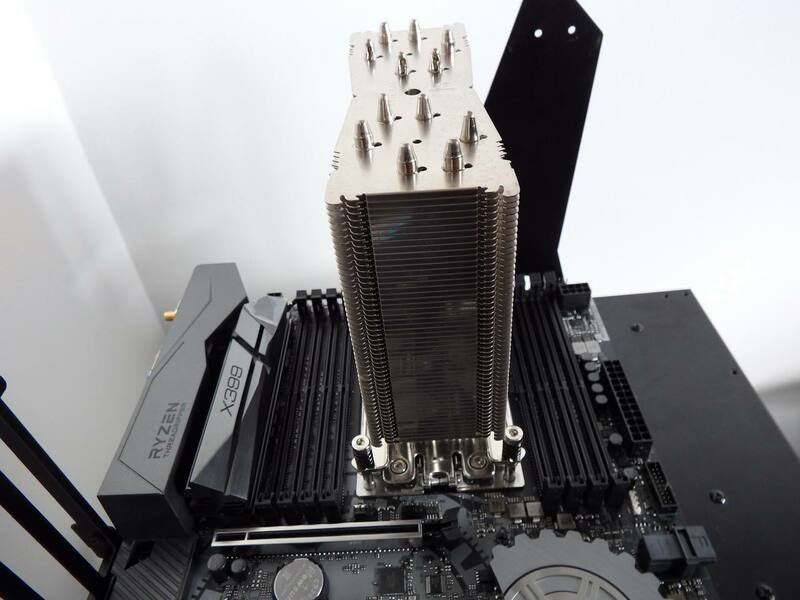 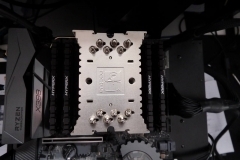 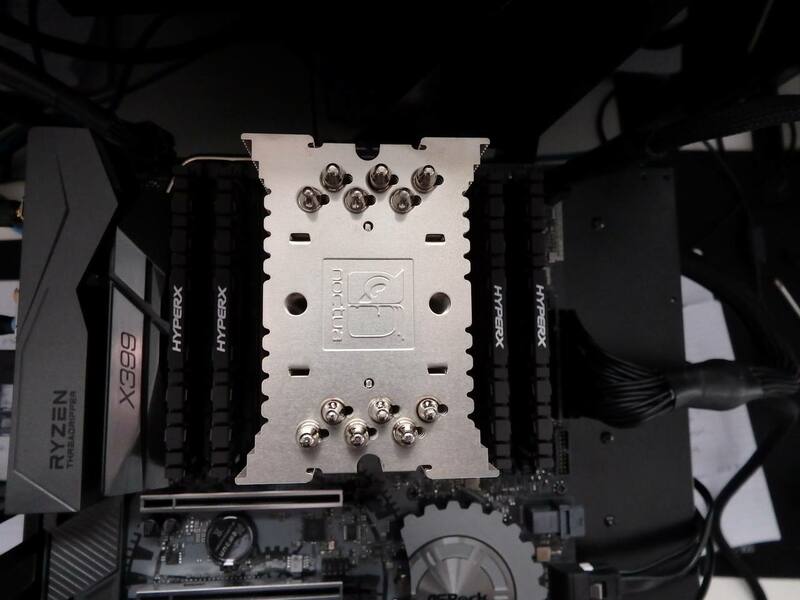 Some of the AIO water coolers appear to have smaller water blocks consistent with other sockets, perhaps more generic, which limits the heat transfer of the dual die Threadripper CPU. 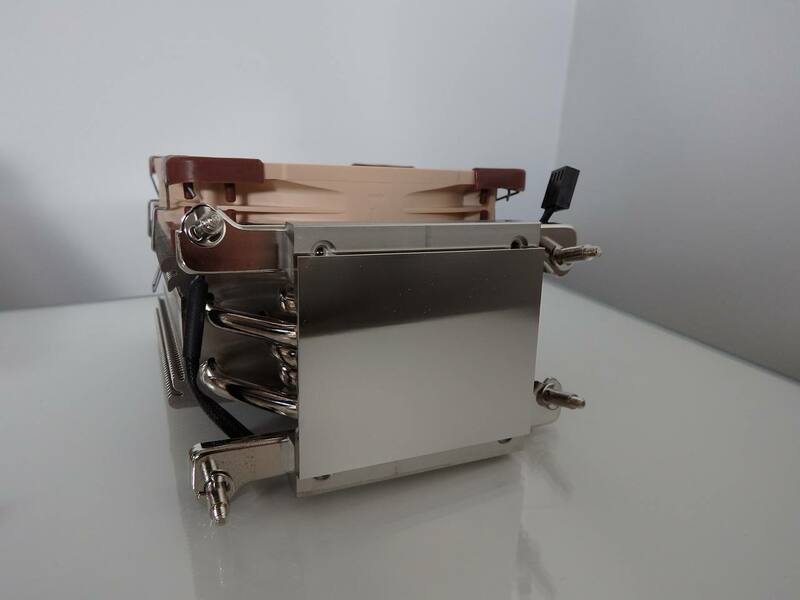 These Noctua coolers all have the larger purpose-built CPU plate designed specifically for AMD’s Threadripper CPU series to maximise the heat transfer CPU to the heat pipes and fins. 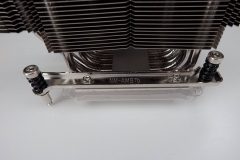 These are not coolers simply adapted to fit a 180W high-end CPU but rather new coolers based on tested production designs to get optimal heat conversion. 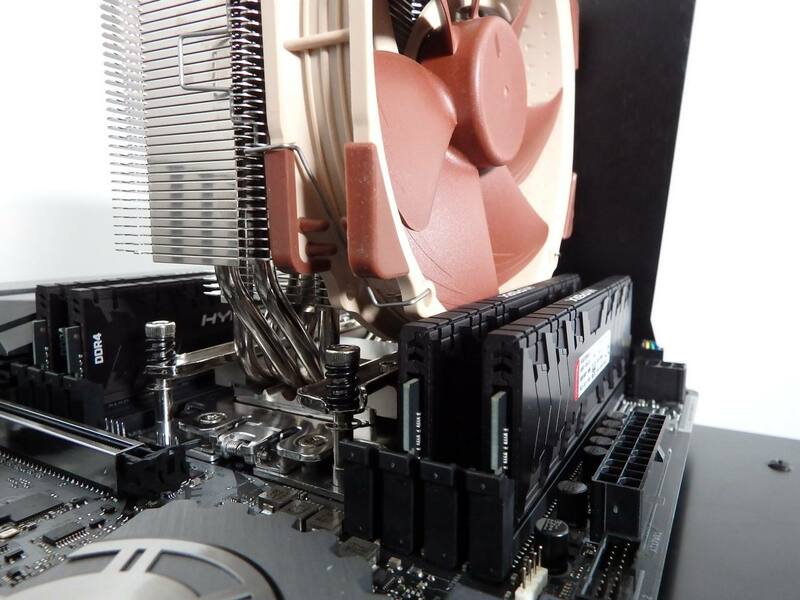 Aesthetically, water coolers look neater on the motherboard with more of the board, LEDs, back plates or graphics cards visible through a side panel. 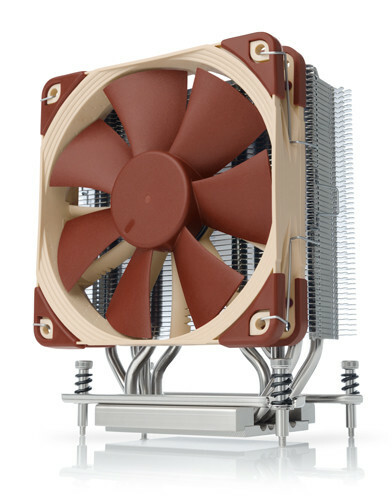 Air coolers are typically more reliable and functional than aesthetically pleasing, but with Noctua’s recent announcement of their Chromax fans, aesthetically improved air coolers might change this dynamic. 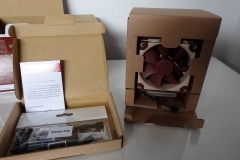 After testing these fans my pick would be the U14S installed with a 3mm offset, and for a personal build, I would choose this over a water-cooler unless I planned to do some serious overclocking. 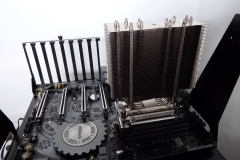 – The RAM slot closest to the CPU may be obstructed if using all 8 slots and tall memory heat spreaders. 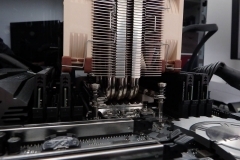 – The RAM slot closest to the CPU may be obstructed if using all 8 slots and tall memory heat spreaders. 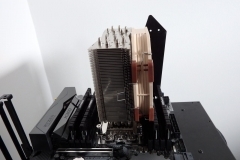 – if using all 8 memory slots, both fans will need to be raised depending on the height of the heat spreaders on the RAM.